For over 30 years, Diversified Waterscapes, Inc. (DWI) has distinguished itself as a leader in the maintenance and restoration of aquatic environments in Southern California and beyond, including the famous Bellagio Fountain in Las Vegas. Golf courses, property management companies, municipalities and public parks have entrusted DWI to restore and maintain their water features. Our dependable team of maintenance professionals is available around the clock 7 days a week. We guarantee prompt, dependable service. 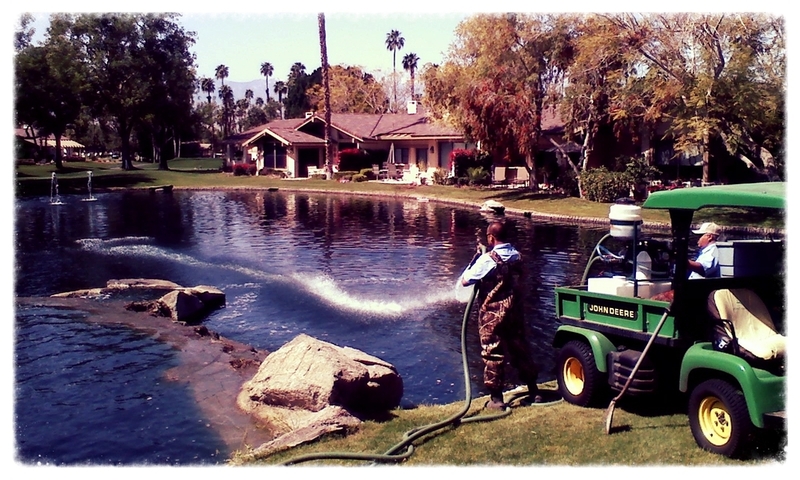 Our maintenance crew is licensed to administer algaecides and pesticides as required by law. Our team is trained to respond quickly and decisively. Our daily report system keeps you updated on the condition and treatment of your waterscapes. We offer a wide range of professional services, as well as a full line of ecologically safe products that are revolutionizing the aquatic industry. We can design a program tailored to your budget and specific needs saving you money and frustration. Diversified Waterscapes, Inc. can design a program tailored to your budget and specific needs saving you money and frustration. As specialists in waterscape maintenance, our program for correct water conditioning is clearly better. Licensed professionals implement a comprehensive five step program designed to improve and maintain your waterscapes.